Is "How we manage" missing from our strategic thinking? Home » 4G Balanced Scorecard » A Modern System of Management » Is “How we manage” missing from our strategic thinking? Something has been bothering me for a while. I have noticed that organisations rarely consider “How we manage” when they are thinking about their strategy. If they do think about how we manage, it is not explicit. It is not management by design. I want to provoke some thoughts and explore the consequences and opportunity. In this article I suggest there is not enough thought given to how we lead and manage our organisations and our people. It is also a piece of the strategy jigsaw that dramatically influences the performance of our people and our organisations. However, explicitly thinking about how we lead and manage is often completely omitted from strategy thinking. It is taken as read. It has become a habit. The problem – the challenge…. External world – what is happening? And where are we in it? How do we align the organisation? Now, how do we execute it, deliver it, and learn from it? (I know… it is simplistic for a reason. Bear with me). Surely, choosing how we manage, is as important as what we manage and what we do. 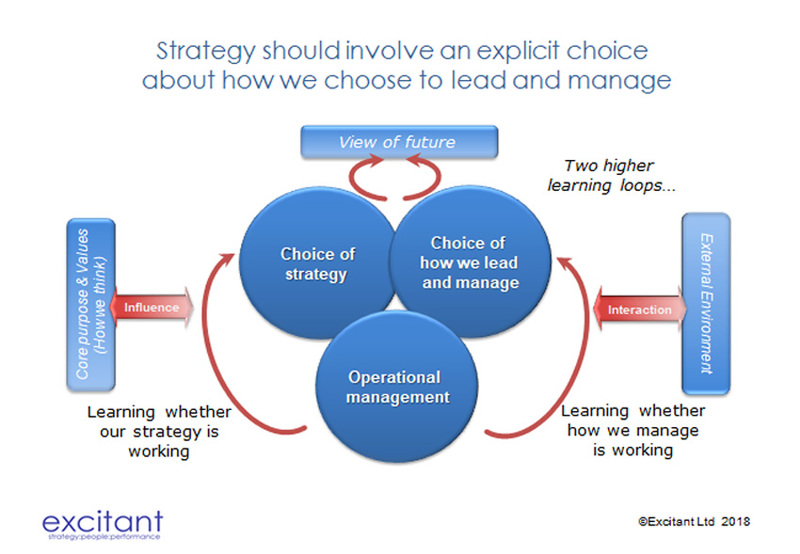 Therefore, ‘How we manage’ should also be an explicit choice: a decision alongside the strategy. Shouldn’t it? In the diagram below, I have placed the design of how we lead and manage alongside the choice of strategy. (You may recognise it as a variant of my Strategic Learning Diagram). What i have here is two learning loops: one looking at the ‘strategy’ and the other looking at ‘how we manage’. Notice that the choice of how we lead and manage, is the same size, and at the same level, as the choice of strategy. That is deliberate. I suggest that ‘the way we lead and manage’ should get as much thought and scrutiny as ‘the Strategy’? Has how we have been managing, been an impediment to how we have delivered our previous strategy? Will how we manage today, be an impediment to implementing our new strategy? Has the world of people and management changed? How is it changing. If we don’t change as well, will it affect whether we can deliver our strategy? What alternatives are there to the way we manage today? Could, how we manage, be an element of our competitive position? Is there a better way? A first thought might be about what we generally call the systems of management. This includes the strategy process, business planning, planning, budgeting, performance management (appraisals), programme management, project management, motivation, reporting lines, span of control, governance, etc. We could explore different ‘systems of management’ you could have. I am not going to. I want to take a step back and go a lot deeper. I want to look deeper, because how we choose and design the way to lead and manage, depends on some things that are more fundamental. The choice and design should be based upon our underlying beliefs and even our philosophy and what we believe about people. It should also be based on how things in the world of work, business and organisations are changing, have changed and will continue to change. The relationship between individuals and organisations is changing. Influencing the design of organisations, and our choices for how we lead and manage. These influences affect how we design our organisations. That choice of our style and approach to leadership and management has many options. The choice, should be an explicit choice; a thoughtful, thought through, choice that should influence our approach to how we want to manage. 1.6. It is not just me…. Over the years, with my many various clients, I have long been intrigued by the variety of management styles and systems and thinking they have. More and more I am seeing a combination of changes in the environment of our organisations that supports this thinking. I am noticing in this piece being explicitly added to the strategy jigsaw in the more progressive strategy articles. It is the deeper thinking that shapes the range of answers that emerge. The deeper thinking about what we believe about people, about work and about our organisations.